Dom tells her she has no idea who voted out Ramses but it wasn’t her. She says her entire side betrayed her. Alex says if there’s someone that is trying to get Dom out find out who it is. Alex will out them and she can put them up. Dom – Name dropping is so yesterday.. When you name drop you feel it adds value to you you are..
Dom goes on about how annoying the younger girls are. Jessica says she just wants things to be good between them. Christmas – I want the same thing. Jessica says she wants her to heal and prove us all wrong..
Christma thanks her says it was an accident and she’s hoping that it proves to America she can face a roadblock and persevere. Xmas – you’re Energy was different when I got here.. I Was like when you got here. Jessica says the Whole Cody thing went very fast. Paul says he told them from the beginning one little crack one little stupid thing. 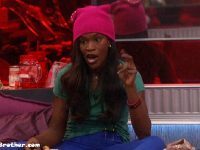 Elena says that Christmas told her she voted Cody out. Paul – I don’t think Christmas is a good liar..
Mark says Alex sin’[t going after Xmas because she’ll be a easy target down the road. Paul – YES.. we don’t pick veto players and not play. Kevin telling him the next person out has gotta be Matt. Jason starts going on about Ramses how he’s making the rounds they can’t trust him. Kevin – do you want us to throw it..
Kevin – if I have the chance to throw it..
Kevin – If I win veto … I don’t take no one off right? Alex is pointing out to Jason that Elena, Mark, Paul and Dom are getting close again. Dom – Certain things were highlighted to support the decision that was made. 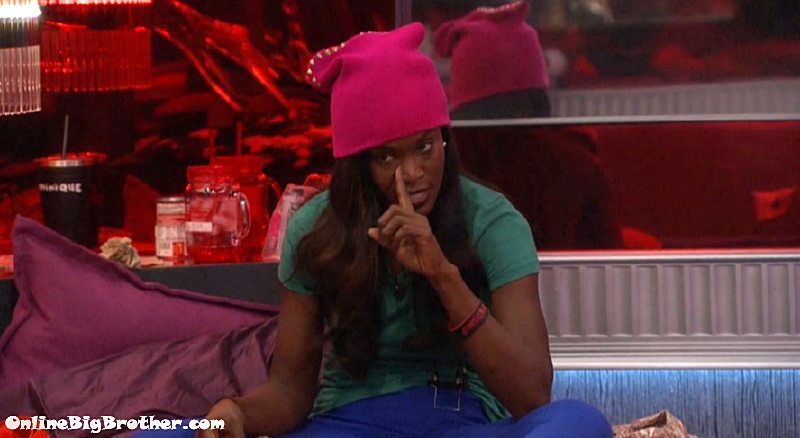 Dom – supposed to be one team one fight..
Dom says there’s more than 1 person in their group that sold her out. Paul – that defeats the whole purpose of a group in my opinion..
Dom – you get rid of the individual that accurate about Senses things way ahead of time.. You get rid of the person that is observant. Dom – You get rid of the person you believe is smart and intellectual. Dom =- AHHHH no but there’s no other reason. Don says theres other people “in this group that we have” that have said concerning things yet I’m the person on the block..
Paul doesn’t think Christmas can even compete. 9:30pm Feeds on dogs.. must be the Power of Veto competition. Who was all picked for veto and any idea why theyre playing early? I don’t think that the nominations are that bad. The alpha showmance group is crumbling due to suspicion. Even if it doesn’t self destruct this week, the trust is broken. They know Christmas isn’t trustworthy, and now not only is the Matt Mark relationship going to strain, but the showmances themselves will have distrust. Without directly targeting a showmance. Dom is Mark’s brain. Their daily ‘chess’ talk information downloads proved that Dom has more sway than even Elena. They weaken one of the house alphas without taking a direct swing at a showmance couple? No heartbreak romantic revenge scenario. This seems like a tactically sound way to break up the alpha alliance with less chance of retribution. dom’s not a terrible nom, but jess is. if she stays up she goes and alex misses a big opportunity. but if Alex is trying to secure herself another week after her hoh, she has to craft a reasonable case of plausible deniability. guns blazing after two members of the showmance alliance means Alex can no longer even pretend to play the middle. She spent a week on the block playing willing ally for the cause for nothing. She stated too many times last week that she wants Jessica gone not to nominate her. She loses all credibility if Jessica isn’t on the block. The members of the Showmance group that promised their loyalty to Alex are the ones that lose credibility if they break their word. The ones that said they’d support her gave Alex ammunition in the form of comments and names from their own group. She has dirt on them now and will be able to tell either Dom or Mark or Jessica or Christmas or the group all of that dirt to further fracture the alliance if they break their word. Let’s be honest. Jessica is still Jessica. If she leaves, oh well so sad for her. I won’t lose a moment of sleep. Jessica still isn’t any kind of friend to Alex. She’s still the deposed queen of the alpha group. She’s still the petty thing she was week one. From exit interviews Cody says he’d like to get back in, join forces with Paul and go after his former allies. Don’t hold any hope with or without Jessica that he’s going to go back in and target Paul. alex has been on the block every week all ready. might as well make a move while she can as i don’t think there’s much she can do to save her game otherwise. and the rest of them following him like sheep. Now that I think about it who else was Alex suppose to put up? Cody was HOH and he’s gone. Paul won HOH and POV and he’s protected. Alex won HOH and POV. Who else is there? Seriously! Dead freaking weight! Two injured, Shrek, Boyz2Men, and Alex’s dimwits! Elena might be the only other option bc she acts like she’s getting it. Sorry I forgot to mention Andrew but she doesn’t have the balls to try him. Add the fact that most of Alex’s “side” has extreme trustworthiness issues. 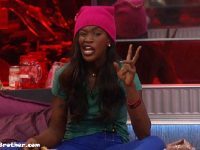 Josh flipped on the Christmas Jillian vote and has switched sides how many times in 24 days? Alex believes either Kevin or Ramses shifted a vote that week as well. 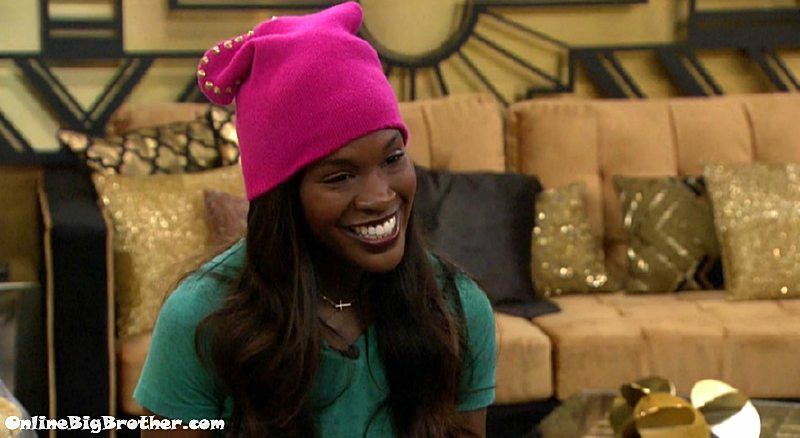 Jessica already wanted her evicted once due to jealousy issues. This is her backup? Sounds like a great time to make a big move. she should have targeted matt as getting him out probably does the most to increase jason’s odds next hoh. she’s already been nominated two weeks in a row, not like there’s much she can do to avoid getting nominated next week anyway already if jason doesn’t win. Anyone want to predict who wins POV? Paul had Kevin to vote for Ramses so he could pin it on one of the girls. This week it is Dom being blamed.Hence Alex thinks Dom is the rat and is to dumb to realize that all boys Paul Kevin Mark Matt etc are trying to pin the girls against each other so the girls can go after one another one by one..Genius plan but so upset that these girls are so dumb? Totally agree with you. That’s why there will never be a strong female alliance on BB. As soon as some guy they want to lay up with or latch on to, like desperate leeches, the females in the house start to destroy each other. Alex KNEW this is what Cody wanted, a female evicted (not Jessica), just in case there’s a ” battle back” and she’s doing just what he wants. Alex is not half as smart as she think she is. Something seems up ??? The veto players were already picked and veto is tonight? Is the veto meeting tommorow then ??? Ideally, I’d like to see Jessica win POV, then have Alex put up either Matt/Raven as a replacement. She can tell them they’re pawns to make sure Dom goes home. Then on Thursday, one of them flips and the Matt/Raven “pawn” goes home. My guess is though, that if noms stay the same, Jessica is going home this week. i think most of the veto players will change the noms, but yeah, regardless who she’s up against jessica would go home, so i hope she comes down. i don’t think there are enough votes to get any of the showmances out over dom though. so dom going is best case scenario, but alex could definitely screw up her hoh more and put up xmas as a replacement for jess and send xmas packing. who got the halting hex? still voting until wednesday. so it’s pretty much a week without a temptation. All I got tonight in bbad was repeat of cody going out. Thats bs. Does “America” really care about Christmas being a persevering kinda chick? Are “personal attacks” no longer allowed? Can people no longer just not like you, Dominique? WTH?! I mean once the BBB season is over, I don’t think about these people anymore. I’m more famous in my life than they are in my life, lol. and for the life of me, I still can’t remember what he looks like. nor anything he did to impact the game. I’m conflicted because I would like to see christmas go up and hopefully the return back or whatever it’s call she won’t be able to play so then it would be the other three and Cody is one of them and I hate him. I don’t know if it’s just his smug look try being nice with at least a few of them in the house not just Jessica. How can you go back in the house with the same hatred that you left with. If Cody does get back in, production will be running this show. Its rather boring when you know days before what’s going to happen like Paul getting every thing and we all know Cody will get back in. I may stop watching. Wooohooo, Jason wins the POV! I seriously hope he takes matters into his own hands and pulls Jessica down (he fought Alex the whole night last night NOT to put Jessica up) & Alex puts up one of the couple’s. Unfortunately, Alex will likely talk him out of this, but one can dream. Don’t waste your HOH, Alex! 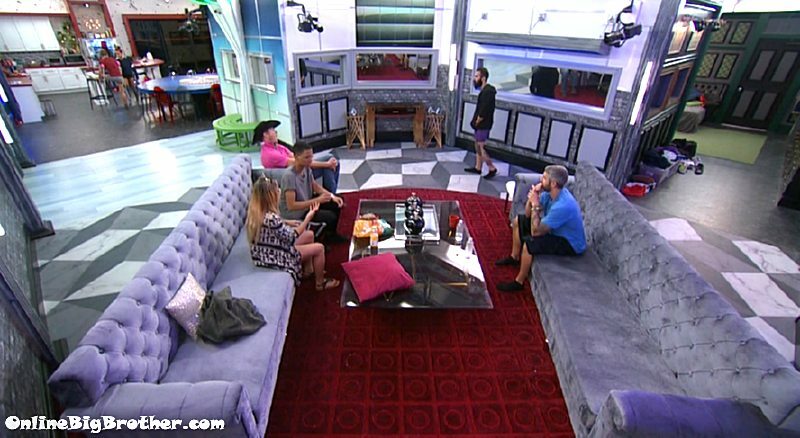 Paul and Alex talking after POV contest mention Eviction is on Sunday….What?? Paul thinks it is a fast forward week. There has been no official notification. Ok. I’m really confused. Have been on vacation for a week and haven’t been able to keep up with all the happenings. But why are some voting for Jessica to get the temptation. Or hoping she doesn’t get evicted this week. Maybe people just want to see Alex make a bigger move than Jessica ? Not sure if I missed something. But i do hope Jessica is sent home because I would say 95% chance Cody will be back. I can’t stand his arrogance but Cody vs Paul is entertaining. However I don’t want to continue watching Jessica and Cody together. I know Jessica is an easy out. But I just can’t stomach her and Cody together again. And it would be kind of fun to see them compete against each other to get back in the house. What is the Halting Hex ,how to use it ??? I feel bad for Dominique. I know this is a game and she has been loyal to the group. Paul knows that Dominique can read him and that’s why he pushed to have her taken out. I wouldn’t want friends like Matt, Raven,Elena, and Mark knowing they could turn and stab her in the back.